Log in to your Blogger account. At Dashboard, click on the related Blog's Name that you'll be working on. Go to your 'Settings' > 'Posts and comments' tab. Then, scroll to 'Who can comment?' and select the option 'Anyone - includes Anonymous Users' and remember to save changes by clicking 'Save Settings' at the top-right of the page. 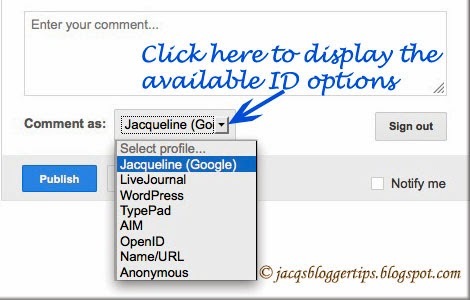 The next image below shows the complete list of identity options made available for Blogger blogs when you select 'Anyone' to comment on your blog. That is all you need to do to enable the complete list of Identity Options for your readers to leave their comments. Easy, right? Take note: by not allowing 'Anyone' to comment on your blog, and by selecting 'Registered User' instead, then the last two options of Name/URL and Anonymous won't be available to commenters as seen in the image below. Select wisely. The choice is yours, of course! Thank you for your kind thoughts, Firsat! 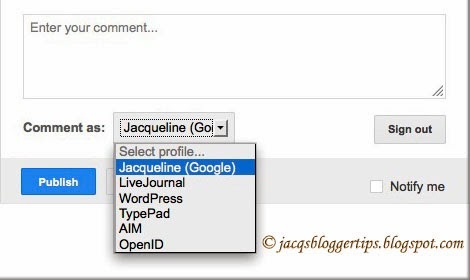 Is this only for blogger or also for the main other blog-websites? Hey Thank You Very Much information !!! Hi, this is one of the great blog post, although all bloggers are just writing for getting traffic, but your blog posts are really helpful. i never check this setting before, thx..
pobud I say trimakasih and pobud I threw sense of pride in your post .It is nice.